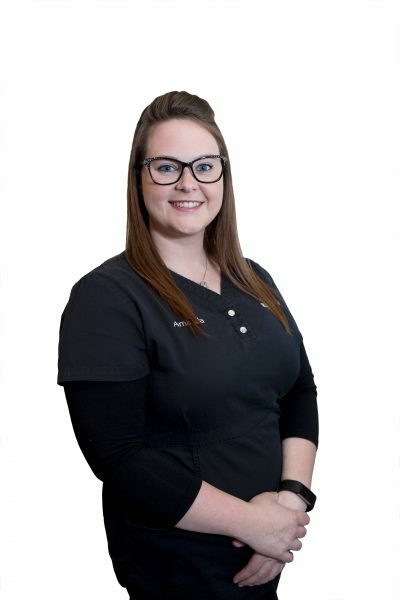 Amanda is the Optical Manager at Ridgeview Eye Care and she brings more than 10 years of experience in the customer service field with her. She excels in fitting our patients with the perfect frame and lens combination to accentuate their style and maximize their visual performance. Amanda follows each individual, specialized eyewear order from the moment it is selected until it is personalized and fit specifically to you. While you are anxiously awaiting your new pair of glasses, Amanda is right there in the lab cutting the lenses and making sure each individual glasses order is perfect. Continually improving her knowledge and skills, Amanda jumps at each opportunity to receive further training and education. She has attended national eyewear conferences such as Vision Expo West in Las Vegas and local conferences such as The Heart of America. Amanda is 100% dedicated and passionate about the work she does and exceeding your expectations is her number one goal. Amanda was born in San Diego, California and has lived in many places, including Italy. She grew up in Olathe, where she graduated from Olathe East High School. Following high school she moved to Lawrence, where she currently lives with her daughter, Makenzie. In her free time, Amanda enjoys spending time with family and friends, just about anything outdoors and working out.